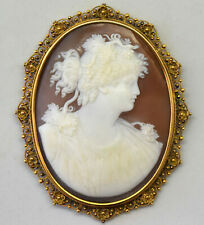 Antique 1800’s Cameo Stick Pin, Beautiful!! Antique Old China 925 Sterling Silver Lapis Lazuli Gemstone Bird Handcrafted Collectible Pin Brooch. Thickness: 7mm. Width: 21mm. BEAUTIFUL ART NOUVEAU DESIGN. A SNAKE WITHIN THE LEAVES. IT ALSO HAS A LITTLE BAIL ON THE BACK, SO IT COULD BE ADDED TO A PENDANT. IT IS A LITTLE DIRTY. I DIDNT WANT TO ATTEMPT TO CLEAN IT IN ANY WAY. Total Weight: 16.34 grams. All The fine jewelry including (Rings, Bracelets, Necklaces, Earrings, etc) are tested and examined by a. Photo may have been enlarged and /or enhanced. Simple enough! I am a Certified Jeweler Gemologist with 40 Years in the Jewelry Industry. I do not take glass or bezels that hold pictures out. All start at 1 cent. No testing is 100% foolproof when analyzing antique jewelry. THERE IS A NICE PIECE OF AGATE SET INTO A 14K GOLD BEZEL, WITH A SMALL FLOWER IN THE CENTER. THE FLOWER HAS A SEED PEARL CENTER AND ONYX PETALS. GREAT CONDITION. This beautiful Victorian brooch is in excellent condition. 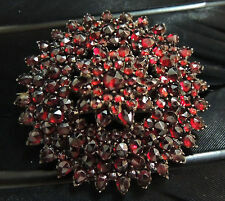 Great brooch to add to any collection. Antique Victorian 10k Gold Banded Agate Brooch. Rare Victorian 14kt Gold Snake Stickpin set with a Diamond and Ruby Eyes. A whimsical Stick Pin having a Snake's Head atop the Pin with it's body undulating down to the base of the Diamond. The snake's eyes are each set with a Red Ruby measuring approximately 1mm each. The rectangular, rough-cut Diamond measures 6.5mm x 5mm. The Diamond is bezel set with black patina encircling it and having 'faux prongs'. There is a small loop for use with a safety chain. The pin measures approximately 3.5" in length from the peak of the snake to the tip of the pin. It measures 0.393" (10mm) at it's widest. The Pin weighs 3.4dwt. It is in good condition having very light wear to the surface of the metal consistent with the Stick Pin's age. It also seems to have a Rose Gold - like coloration. Pin is 45 x 13mm - Seed Pearls - Not Stamped but tested 9K Gold - 3.9 Grams - Pin Stem is gold. I do not take glass or bezels that hold pictures out. Simple enough! I will throw in Micro Mosaic and Pietra Dura along the way. The pin is shaped like a starburst and the face is set with seed pearls that make the star shine. It features both a brooch pin clasp as well as a top loop to be strung on a chain. The piece is crafted of 14k yellow gold and the back is marked "M.M. 14K XMAS 1904". BEAUTIFUL ORCHID DESIGN WITH A LITTLE HALF SEED PEARL IN THE CENTER. IT WEIGHS 1.65 GRAMS. THIS ISNT THAT BIG, BUT IT IS STILL AN AMAZING PIECE. ITS A NICE YELLOW GOLD, AND MIGHT EVEN BE 15K GOLD. GORGEOUS VICTORIAN ETRUSCAN REVIVAL BROOCH / PENDANT THAT HAS A MOONSTONE ORB IN THE CENTER. Sadly I do not know it's origin or it's age. But it is obviously quite old and was a fine piece of jewelry. The image is of a woman wearing a hat with flowers cascading down and a pearl necklace. All of the stones are present. Marked 14k on the backside. Quarter to show size. We always try to carry Old Pawn jewelry for sale. Sweet petite victorian pendant converted from a brooch circa 1880. The blue sapphires are a dark blue color but with the light they show hints of vibrant blue It is 14k gold and marked on the back of the clover. Pin is 31 x 22mm - Dangle Pearl - Not Stamped but tested 14K Gold - 3.9 Grams - Pin Stem is NOT gold. Simple enough! I am a Certified Jeweler Gemologist with 40 Years in the Jewelry Industry. I do not take glass or bezels that hold pictures out. Pin is 25 x 20mm - Engraved "Sallie from Uncle Charles, Feb 9th 1864" - Not Stamped but tested 14K Gold - 4.7 Grams - Pin Stem is gold. I do not take glass or bezels that hold pictures out. I will throw in Micro Mosaic and Pietra Dura along the way. Marked 14K. The condition is very good. One of the pearls is much smaller than the others- overall very nice condition for its age with light surface wear here and there. Looks FANTASTIC! Pin is 39 x 19mm - Mine Cut Red Spinel and Pearls - Not Stamped but tested 9K Gold - 4.5 Grams - Pin Stem is gold. Simple enough! I do not take glass or bezels that hold pictures out. I am a Certified Jeweler Gemologist with 40 Years in the Jewelry Industry. All start at 1 cent. Pin is 32mm - Pearls - Not Stamped but tested 15K Gold - 11.3 Grams - Pin Stem is gold. Simple enough! I am a Certified Jeweler Gemologist with 40 Years in the Jewelry Industry. Beautiful Antique Victorian 14k Yellow Gold and Green Jade Bar Brooch. Gold is not marked, But test to 14k. The bands wrapped around the jade and the catch are 14k, the sharp pin part is not gold. Dating is done by studying the "C" Catch and the long tube Hinge. With no marks exact age is difficult. Believed to be 1890s to turn of the century approximately. Please go online and study hinge and catch dating for your peace of mind. Jade has one very minor flaw on tip shown by pencil in photo, can't really see but can feel it. It was acquired as part of an estate with many high end marked pieces. Truly a great piece for any collection. Please look at the photos was they are part of the description. Any Questions please ask. Thank you for looking. The pin is crafted out of 14k yellow gold to look like an Ivy stem with leaves and flowers adorned with seed pearls. Condition: Fine estate condition. Clasp opens and closes securely. Likely used rarely, if ever. Stones: AMBER 12mm by 10mm. Length: 2.5". Simple enough! Pin is 41 x 33mm - Pearls - Not Stamped but tested 15K Gold - 12.6 Grams - Pin Stem is gold. I do not take glass or bezels that hold pictures out. I am a Certified Jeweler Gemologist with 40 Years in the Jewelry Industry. Pretty antique sterling silver brooch. Not marked but acid tests as sterling silver. Ornate floral design on the front. Otherwise very good condition. This is my fault and I will take full responsibility. The brooch is crafted of a 14k yellow gold pin with a lovely platinum filigree mounting that is set with ~.16cttw of diamonds. Condition: Very fine estate condition. Clasp opens and closes securely. Marks : 14K BXW. Weight : 2.82 grams. Vintage Victorian MOURNING Brooch GOLD GF Black Enamel PIN Etched. Shipped with USPS First Class Package. The pin features a round brilliant cut center diamond and two round blue sapphires set in 14k yellow gold with a platinum top filigree mounting. The clasp is marked "14K". ﻿Condition: ﻿Very fine estate condition. Gold: pin 14K Yellow Gold (tested), back is not gold. Condition: item in fine estate condition consistent with age/ normal wear. Total Weight: 2.4g. Pin is 32mm - Pearls - Not Stamped but tested 14K Gold - 8.8 Grams - Pin Stem is NOT gold. Simple enough! I am a Certified Jeweler Gemologist with 40 Years in the Jewelry Industry. I do not take glass or bezels that hold pictures out. Antique Victorian 14K Yellow Gold Sapphire Seed Pearl Crescent Pin Brooch Moon. Shipped with USPS First Class Package. Antique 14k yellow gold pin. Beautiful Sapphires and Pearls. Crescent design. Hallmarked: 14k Perfect condition. Style: Art Nouveau. Type: Stick Pin. Gender: Female. Condition: This stick pin has been professionally cleaned! Antique Victorian 14k Sapphire Griffin Dragon Pendant Stick Pin Conversion. Shipped with USPS First Class Package. For consideration, a lot of 3 victorian gold filled stick pins. They are shown by a ruler for size comparison. Size They are shown by a ruler for size comparison. Weight(grams) 5 Grams. Material Gold Filled. Stamped 14k, yellow gold, circa 1880. Piece is beautifully decorated made of solid sterling silver. The pin features a super fancy repousse floral flower pansy design. The pin is well made and lovely! Piece is well made; and in good condition; however, it is preowned, and has surface scratches and dings from use or wear and there are small pitting marks.marked sterling. This is a beautiful Scottish agate brooch which has a cairngorm stone at the center and small agate stones around the edge. 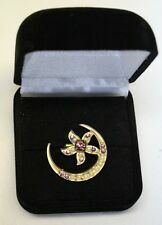 Pin is 32 x 20mm - Rose Cut Diamonds - Not Stamped but tested 18K Gold - 6.7 Grams - Pin Stem is gold. I am a Certified Jeweler Gemologist with 40 Years in the Jewelry Industry. Simple enough! I do not take glass or bezels that hold pictures out.